Analyzing text data using Stanford’s CoreNLP makes text data analysis easy and efficient. With just a few lines of code, CoreNLP allows for the extraction of all kinds of text properties, such as named-entity recognition or part-of-speech tagging. CoreNLP is written in Java and requires Java to be installed on your device but offers programming interfaces for several popular programming languages, including Python, which I will be using in this demonstration. Additionally, it supports four languages other than English: Arabic, Chinese, German, French, and Spanish. The command mv A B moves file A to folder B or alternatively changes the filename from A to B. The cd command opens the folder we created. Then, to run the server, we use Java. The parameter -mx6g specifies the amount of memory that CoreNLP is allowed to use. In this case, it’s six gigabytes. The -timeout 5000 parameter specifies the timeout in milliseconds. The number I’ve highlighted is going to be important when using CoreNLP in Python. I’m going to use py-corenlp but there are other Python packages that you can check out here. If you should happen to be an avid user of NLTK, there is also an API for NLTK that lets you use CoreNLP. The full instructions can be found here. The rest of this demonstration is going to focus on py-corenlp but you could also use NLTK as pointed out above. The main difference between the two is that in py-corenlp outputs a raw JSON file that you can then use to extract whatever you’re specifically interested in while NLTK provides you with functions that do so for you. The only other function needed to conduct NLP using py-corenlp isnlp.annotate() . Inside the function, one can specify what kind of analysis CoreNLP should execute. In this demonstration, I will take a look at four different sentences with different sentiments. All of this can be done in one single line of code but for readability purposes, it’s better to stretch it over several lines. text = "This movie was actually neither that funny, nor super witty. The movie was meh. I liked watching that movie. If I had a choice, I would not watch that movie again." The annotators parameter specifies what kind of analyses CoreNLP is going to do. In this case, I’ve specified that I want CoreNLP to do sentiment analysis as well as named-entity recognition and part-of-speech tagging. The JSON output format will allow me to easily index into the results for further analysis. 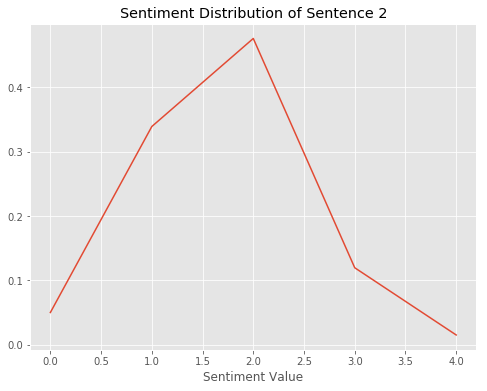 The scale for sentiment values ranges from zero to four. Zero means that the sentence is very negative while four means it’s extremely positive. As you can see, CoreNLP did a very good job. The first sentence is tricky since it includes positive words like ‘funny’ or ‘witty’, however, CoreNLP correctly realized that they are negated. The easier sentences were classified correctly too. As you can see, the distribution peaks around a sentiment value of two and can thus be classified as neutral. The abbreviations in parentheses represent the POS tags and follow the Penn Treebank POS tagset, which you can find here. To give you an intuition, PRP stands for personal pronoun, VBD for a verb in past tense, and NN for a noun. As we can see, CoreNLP has correctly identified that Jim and Jessica are people, Apple is an organization, Chicago is a city, and the United States is a country. Before explaining how to shut down the server, I’d like to point out that CoreNLP provides many other functionalities (lemmatization, stemming, tokenization, etc.) that can all be accessed without having to run any additional computations. A complete list of all parameters for nlp.annotate()can be found here. If you would like to shut down the server, navigate to the terminal window you used to start the server earlier and press Ctrl + C .
To summarize, CoreNLP’s efficiency is what makes it so convenient. You only have to specify what analysis you’re interested in once and avoid unnecessary computations that might slow you down when working with larger data sets. If you’d like to know more about the details of how CoreNLP works and what options there are, I’d recommend reading the documentation. Global Natural Language Processing (Nlp) Market Report presents an irreplaceable and sheer analysis for Natural Language Processing (Nlp) industry. The study report comprises evaluation of numerous influential factors including industry overview in terms of historic and present situation, key manufacturers, product/service application and types, key regions and marketplaces, forecast estimation for global market share, revenue and CAGR. It is focused on active contenders in Natural Language Processing (Nlp) industry and provides analysis for their production methodologies, manufacturing plants, and capacities, product cost, raw material sources, value chain analysis, effective business plans, product/service distribution pattern. Player’s profiling including product specification, sales, gross margin, share in the global market, revenue, and CAGR also. If you have any customized requirement need to be added regarding Natural Language Processing (Nlp) , we will be happy to include this free of cost to enrich the final study. A natural language processing system helped identify lumbar spine imaging findings, providing significant gains in model sensitivity, according to a study in Academic Radiology. Researchers evaluated an NLP system built with open-source tools for identifying lumbar spine imaging findings related to low back pain on MRI and X-ray radiology reports from four health systems. The study authors selected 871 reports to form a reference-standard dataset, and four spine experts annotated the presences of 26 findings. The researchers calculated inter-rater agreement and finding prevalence from the annotated data, which was split into development (80 percent) and testing (20 percent) sets. The study authors developed an NLP system from both rule-based and machine-learned models, and the system with validated using accuracy metrics such as sensitivity, specificity and area under the receiver operating characteristic curve. The researchers concluded the NLP system performed well in identifying the 26 lumbar spine findings. Machine-learned models provided substantial gains in model sensitivity with only a slight loss of specificity and overall higher AUC. In basic terms, Natural language processing or NLP is the ability of the system to understand the human language spoken to it, analysing the words and taking actions according to its analysis. It is widely used in various areas such as machine translation, speech processing and many others. This technology has been around for a couple of years now and has gone unnoticed by the public until now. NLP has seen massive developments recently in this sector to improve and enhance the experience of customer interaction with other humans, bots etc. Moreover, there have been improvements to increase the efficiency of this system for search, bots as well as the user interface which has made it a priority for quite a lot of users. Gone are the days that people used to search content using the search engines by entering keywords, topic names etc. With the recent developments by many tech giants such as Google which has included NLP in its search function which now enables the people to speak out the content, they want to search. Moreover, data can be explored in a better way by speaking rather than changing settings, applying filters etc. to get the desired content. Chabot’s is the easiest method of presenting the consumer with the desired information almost immediately. The clubbing of NLP with Chabot’s is what made it all possible. The most practical example of this technology is finding a right product by letting the Chabot know your desired quantity, size and colour, performing self-serving tasks such as personal banking etc. NLP provides a more personalized look and feel to the customer-Chabot interaction. The best and most used application of NLP is virtual personal assistants that have been rolled out by the companies to help the people search and perform tasks by the use of their voice such as Alexa. Alexa is loaded with tons of features and capabilities that can be controlled by you by a simple question by you. The new era of natural language processing has already begun. Now the humans need not adapt to the new technology, now the technology is smart enough to adapt to the humans. There have been several reports that in the recent years more than fifty percent of the tasks will be performed with the help of NLP rather than typing etc.